Download your Free Tenant Screening Whitepaper! Learn what makes a great Tenant Screening service. 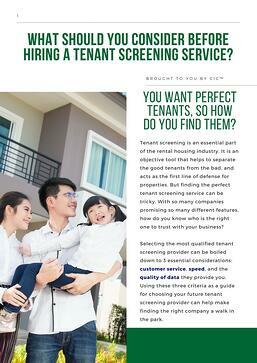 Tenant screening is an essential part of the rental housing industry.Get an inside scoop on vital criteria you should be looking for when selecting a tenant screening service. Complete the form to get full access to your downloadable 'What Should You Consider Before Hiring a Tenant Screening Service?' Whitepaper.